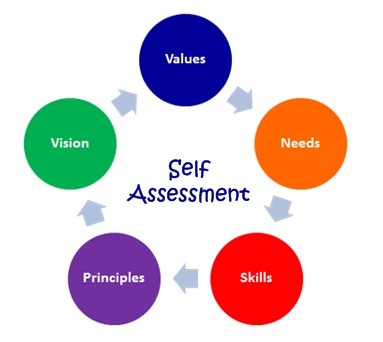 Self assessment is the process of gathering information about ones own aptitude, skills, competencies, and talents and critically reviewing the quality of his or her performance and abilities. Self-Assessment is different from self-awareness and self-discovery in that awareness and discovery is simply a recognition of something or knowing something exists. Assessment, on the other hand, is determining or measuring an amount, value, importance, extent, or rate of something. For example, you may be aware that your cup has water in it, however, you may not know the amount of water until you measure it. Self-awareness increases your understanding of who we are, while self-assessment helps measure and gauge your skills and competencies in order to further develop them. For example, through self-awareness you may discover you enjoy playing soccer or singing. However, it is through self-assessment where you can determine the level of your skills and competencies in those areas. 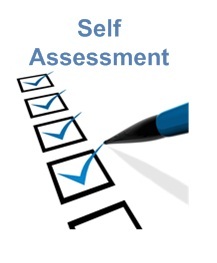 Self-assessment also allows you to recognize your potential as well as what you have to do to achieve that potential. Through the self-assessment process, you not only recognize your strengths, but also measure, gauge and analyzes those strengths. The process also allows you to recognize and acknowledge your weaknesses to open yourself to addressing them to make us a better person. After the completion of a self-assessment, you are better able to set and reach your goals. By knowing what specific skills you need to develop or work on, you are able to focus your attention on those skills and making yourself more proficient at them.